PV-generated electricity is seeing rising market demand and falling cost. Once PV generation has achieved grid parity, it will become one of the most competitive source of energy on the market, creating additional demand and environmental benefits. With the goal of grid parity in mind, participants across the PV industry chain work to raise the conversion efficiency of their products as well as driving down their costs. Polysilicon supplier focus improving crystal quality. Silicon wafer suppliers optimizes processes such as crystallization and wafer slicing. PV cell makers on the other hand employs a range of technologies to increase the cell’s conversion efficiency, including PERC, black silicon, HJT and N-type cells. In the downstream sectors, PV module makers and system vendors experiment with different assembling methods and BOS designs to reduce CTM loss and boost generation efficiency. A major trend in the global PV market in recent years has been the competition to develop better mounting for PV systems. To maximize the period that modules receive sunlight, PV systems tilt at an angle. In the case of fixed-mounted PV systems, their optimal incline angles take account of the latitudinal regions where they are located. Another way for modules to get the most sunlight is to have them turned automatically towards the moving sun throughout day. This concept therefore gave rise to solar trackers that have attracted considerable interests in major regional markets, including Japan, China and the U.S. 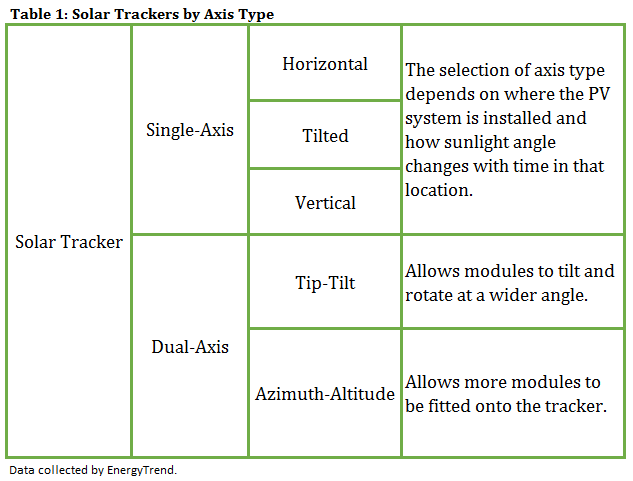 The main difference between solar trackers and fixed-tilt PV systems is that the modules of solar trackers can change their tilt angles at different times of the day. The time during which modules are directly facing the sun is maximized, and this in turn raises the power generation of the system. BIG SUN, the premier specialist in solar energy solutions, says solar trackers has up to 60% more annual power output than that of fixed-tilt PV systems. 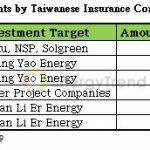 This finding is based on data from actual PV projects undertaken by the company. 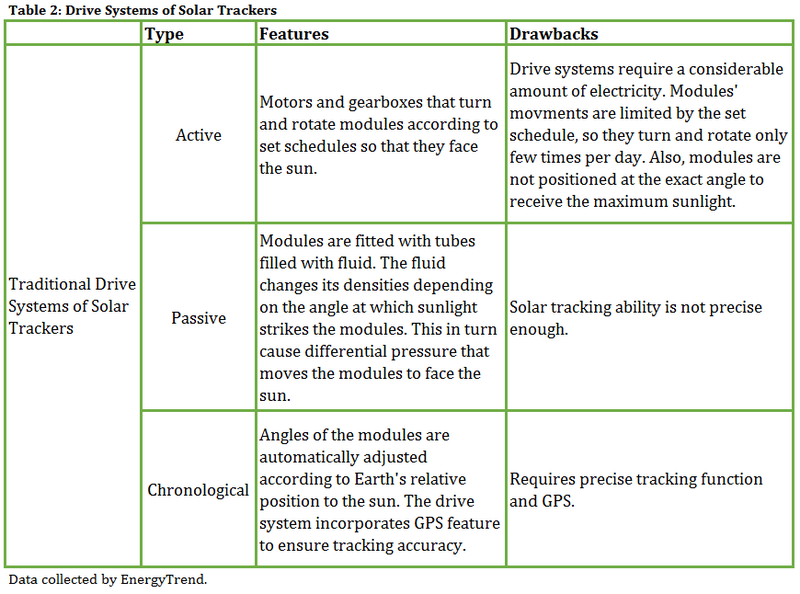 Solar trackers are divided into two main types: single-axis trackers (SAT) and dual-axis trackers(DAT). The table below briefly describes their features. In general, single-axis trackers tilt at a horizontal angle whereas dual-axis trackers can rotate. Considering that the angle of sun rays can shift radically according to seasons, dual-axis trackers have greater annual power output than single-axis trackers do. On the other hand, single-axis trackers have simpler design structures. They therefore are less costly and more durable. Their drive systems that are responsible for tilting the modules also use less power. As a result, single-axis trackers are still the market mainstream. BIG SUN also has patents on single-axis tracker design, but the market is already saturated with similar products. Instead of making the same products as the competitors, BIG SUN has chosen to pursue a solution that is more advanced technologically and will have a longer presence in the market. Thus, BIG SUN aims to develop the most perfect dual-axis solar tracker. For a long time, solar trackers have three major shortcomings that constrain their market expansion. First, they are easily damaged and costly to maintain. Secondly, they do not make precise angular alignment with the sun. Lastly, they are expensive, especially the dual-axis type. 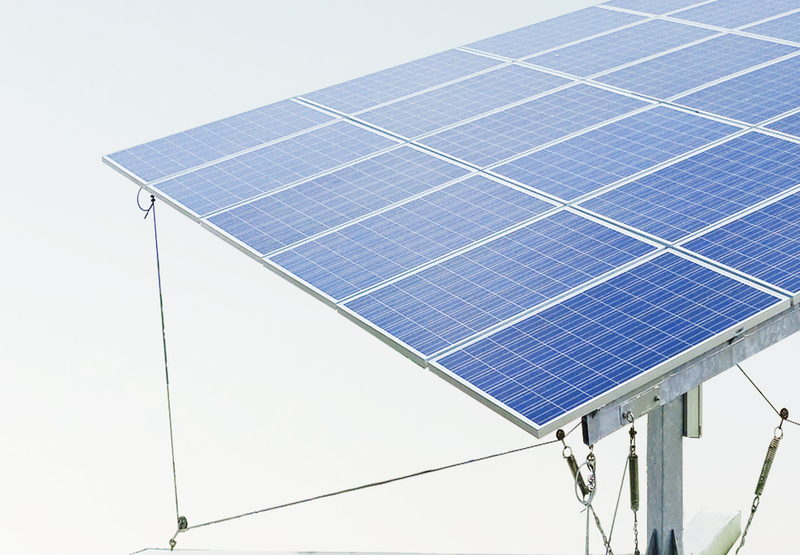 In the area of structural stability, iPV Tracker is the first solar tracker to use a seismic spring isolator to counteract against forces of high wind load and vibrations that occur during operation. This effectively reduces the failure rate of the power drive system of the solar tracker. To find out the actual operational availability rate of iPV Tracker, BIG SUN made an analysis of over 6MW of PV projects that the company set up in Japan. According to the data, iPV Tracker average utilization rate is at 99.94%. This highly reliable performance results have helped expand BIG SUN’s customer base in Japan significantly, and iPV Tracker orders have reached around the 10MW mark. BIG SUN currently has the largest market share for dual-axis solar trackers in Japan – an enormous success by all measures. The mechanical structure of iPV Tracker allows the modules to make a full rotation. There are no gear wheels, so the inclination angle can be exact and rather than basing on the profiles and pitches of gear teeth. Furthermore, iPV Tracker also has a sundial program that accurately tracks the sun along its orbit, thus allowing the tracker to operate chronologically according to the solar year seasons. Also, iPV Tracker adjusts its angle every five minutes to keep its alignment with the sun, thereby limiting the alignment error to under 0.5°. These features, together with the near perfect rate of operational availability, make iPV Tracker the most efficient and reliable solar tracker on the market right now. 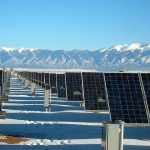 BIG SUN had an opportunity to deploy and test iPV Trackers in China’s Xinjiang Province under the invitation of the major local solar provider TBEA. Based on the data from TBEA’s demonstration project, iPV Tracker has achieved several impressive results. Versus fixed-tilt systems, iPV Tracker can generate as much as 90% more electricity per day and 50~60% more on average per year. Versus single-axis horizontal tracker, iPV Tracker can deliver about 22% more electricity during the summer and around 34% more on average per year. Versus dual-axis trackers from other manufacturers, iPV Tracker has an annual output advantage of about 11%. “There are two crucial reasons why iPV Tracker manages to surpass its competitions,” explained Luo. “First, the system operates reliably and is extremely accurate in solar tracking as the alignment error is kept within 0.5°. Secondly, iPV Tracker offers the largest inclination angle for modules. It therefore has a clear advantage in high-latitude regions.” With huge increases in efficiency, iPV Tracker is being recognized as one of the leading solar trackers on the international market, and BIG SUN so far has received over 1GW-worth of orders for iPV Tracker, revealed Luo. Since dual-axis trackers are more technologically challenging to develop, they have to be very efficient. For each system unit, an increase in its power output is equivalent to a reduction in its costs per kWh of electricity generated. The cost of an iPV Tracker is already quite low as its mechanical structure is based on a simple and solid design. Various details of the system are modified over the years, further improving the tracker’s overall dependability. In the current U.S. market, iPV Tracker has struck an excellent balance between cost and performance compared with single-axis trackers. Since increasing the volumes is an important cost reduction method, BIG SUN will follow up its existing 24-panel iPV Tracker with a new 48-panel model that enlarges the scale for single-unit installations. In addition, Luo expects more PV power plant operators will be interested in deploying such a system, and increasing adoption by them will also boost the overall demand. Installation of large-scale solar trackers by both individual consumers and utility companies will be effective in bringing down the costs of solar trackers as a whole. Higher quality of power generation creates more market demand, which in turn brings down the cost of generation. This is the positive feedback loop that promotes development across the PV industry chain, from the raw material suppliers in the upstream to the system vendors in the downstream. Both the supply and demand side will have to keep raising efficiency rates while cutting down costs in order to sustain growth and help PV generation achieve grid parity as quickly as possible.